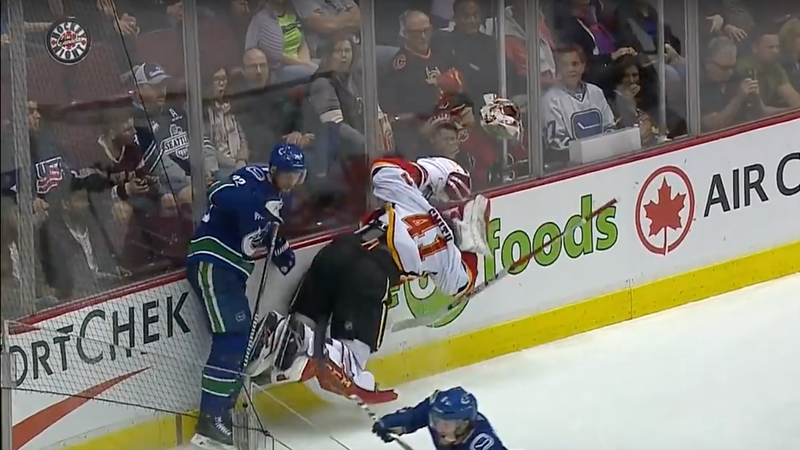 Calgary Flames goalie Mike Smith is no stranger to the fine art of flopping, but when you really want a call to go your way, you can’t just flail your arms and hope an official notices. Sometimes, you have to up your game and add some practical effects, like Smith did towards the end of Saturday’s game against the Canucks. There is some contact here, courtesy of Alex Edler, but as soon as Smith feels it, he goes flying like he got shot out of a cannon, and so does his mask. And then Smith has the gall to make some “What the hell?” faces at Edler once he gets back up, as if it’s not his own damn fault he refuses to fasten his mask on tight enough. The refs’ attention was sufficiently captured, however. Edler picked up an interference minor, and the Flames went on to win. Soccer Coach Suffers Brutal, Non-Existent Agony After A "Headbutt"